Apollo:The God of Light,God of The Sun,Archer,Lawgiver,Favorite Son Apollo is a god of Greek mythology, the son of Zeus and Leto, and the twin of Artemis (goddess of the hunt). In later times he became equated with Helios, god of the sun. "Hear me," he cried, "O god of the silver bow, that protectest Chryse and holy Cilla and rulest Tenedos with thy might, hear me oh thou of Sminthe. If I have ever decked your temple with garlands, or burned your thigh-bones in fat of bulls or goats, grant my prayer, and let your arrows avenge these my tears upon the Danaans." Thus did he pray, and Apollo heard his prayer. He came down furious from the summits of Olympus, with his bow and his quiver upon his shoulder, and the arrows rattled on his back with the rage that trembled within him. He sat himself down away from the ships with a face as dark as night, and his silver bow rang death as he shot his arrow in the midst of them. "Appollo is the embodiment of a masculine attitude that observes and acts from a distance. As god,architype,and man,he "shines";he was the most important son of Zeus,and his attributes lead to success within a patriarchy. He is very much at home in the sky realm of intellect, will,and mind. Yet although he is noted for clarity and form,there is nonetheless,both a hidden and a dark aspect to Apollo." Jane Shinoda Bolen,M.D. "Gods in Everyman:A New Psychology of Men's Lives and Loves"
The son of Zeus and Leto, and the twin brother of Artemis. Apollo was the god of music (principally the lyre, and he directed the choir of the Muses) and also of prophecy, colonization, medicine, archery (but not for war or hunting), poetry, dance, intellectual inquiry and the carer of herds and flocks. He was also a god of light, known as "Phoebus" (radiant or beaming, and he was sometimes identified with Helios the sun god). He was also the god of plague and was worshiped as Smintheus (from sminthos, rat) and as Parnopius (from parnops, grasshopper) and was known as the destroyer of rats and locust, and according to Homer's Iliad, Apollo shot arrows of plague into the Greek camp. Apollo being the god of religious healing would give those guilty of murder and other immoral deeds a ritual purification. Sacred to Apollo are the swan (one legend says that Apollo flew on the back of a swan to the land of the Hyperboreans, he would spend the winter months among them), the wolf and the dolphin. His attributes are the bow and arrows, on his head a laurel crown, and the cithara (or lyre) and plectrum. But his most famous attribute is the tripod, the symbol of his prophetic powers. When the goddesss Hera, the wife of Zeus (it was he who had coupled with Leto) found out about Leto's pregnancy, she was outraged with jealousy. Seeking revenge Hera forced Leto to roam the earth in search of a place to give birth. Sicne Hera had forbidden Leto to stay anywhere on earth, either on terra-ferma or an island at sea, the only place to seek shelter was Delos, being in the center of the Aegean, and also difficult to reach, as there were strong under-currents, because it was said to be a floating island. Because it was a floating island, it was not considered either of Hera's prohibitions, and so Leto was able to give birth to the divine twins Apollo and Artemis (before Leto gave birth to Apollo, the island was encircled by a flock of swans, this is why the swan was sacred to him). As a gesture of thanks Delos was secured to the sea-bed by four columns to give it stability, and from then on it became one of the most important sanctuaries to Apollo. (A variation of Apollo's birth was that the jealous Hera had incarcerated Ilithyia, the goddess of childbirth, but the other gods intervened forcing Hera to release Ilithyia, which allowed Leto to give birth ). Apollo's first achievement was to rid Pytho (Delphi) of the serpent (or dragon) Python. This monstrous beast protected the sanctuary of Pytho from its lair beside the Castalian Spring. There it stood guard while the "Sibyl" gave out her prophecies as she inhaled the trance inducing vapors from an open chasm. Apollo killed Python with his bow and arrows (Homer wrote "he killed the fearsome dragon Python, piercing it with his darts"). Apollo not only took charge of the oracle but rid the neighboring countryside of widespread destruction, as Python had destroyed crops, sacked villages and polluted streams and springs. However, to make amends for killing Python, as the fearsome beast was the son of Gaia, Apollo had to serve king Admetus for nine years (in some versions eight) as a cowherd. This he did, and when he returned to Pytho he came in the guise of a dolphin bringing with him priests from Crete (Apollo's cult title "Delphinios" meaning dolphin or porpoise, is probably how Delphi was so named). After killing Python and taking possession of the oracle, the god of light (Phobus) became known as "Pythian Apollo". He dedicated a bronze tripod to the sanctuary and bestowed divine powers on one of the priestesses, and she became known as the "Pythia". It was she who inhaled the hallucinating vapors from the fissure in the temple floor, while she sat on a tripod chewing laurel leaves. After she mumbled her answer, a male priest would translate it for the supplicant. Delphi became the most important oracle center of Apollo, there were several including Clarus and Branchidae. Apollo, as with Zeus his father, had many love affairs with goddesses and mortals. Apollo's infatuation for the nymph Daphne, which had been invoked by the young god of love Eros, because Apollo had mocked him, saying his archery skills were pathetic, and Apollo's singing had also irritated him. Daphne was the beautiful daughter of the river god Ladon, and she was constantly pursued by Apollo. To escape from Apollo's insistent behavior, she fled to the mountains, but the persistent Apollo followed her. Annoyed by this, she asked the river god Peneus for help, which he did. As soon as Apollo approached Daphne, he tried to embrace her, but when he stretched out his arms she transformed into a laurel tree. Apollo, distraught by what had happened, made the laurel his sacred tree. Apollo also loved Cyrene, she was another nymph, and she bore Apollo a son: Aristaeus, a demi-god, who became a protector of cattle and fruit trees, and a deity of hunting, husbandry and bee-keeping. He taught men dairy skills and the use of nets and traps in hunting. The most famous mortal loves of Apollo was Hecuba, she was the wife of Priam, the king of Troy. She bore him Troilius. Foretold by an oracle, as long as Troilius reached the age of twenty, Troy could not be defeated. But the hero Achilles ambushed and killed him, when the young prince and his sister Polyxena secretly visited a spring. Apollo also fell in love with Cassandra, the sister of Troilius, and daughter of Hecuba and Priam. He seduced Cassandra on the promise that he would teach her the art of prophecy, but having learnt the prophetic art she rejected him. Apollo, being angry of her rejection punished her, by declaring her prophecies never to be accepted or believed. Asclepius, the god of healing, was also Apollo's offspring, after his union with Coronis, who was daughter of Phlegyas, king of the Lapiths. While she was pregnant by Apollo, Coronis fell in love with Ischys, son of Elatus, but a crow informed Apollo of the affair. Apollo sent his twin sister Artemis to kill Coronis, and Artemis carried out he brothers wishes. While her body was burning on the funeral pyre, Apollo removed the unborn child, and took him to Chiron, who raised the child Asclepius. Apollo also, as did his father Zeus, fall in love with one of his own gender, Hyacinthus, a Spartan prince. He was very handsome and athletic, which inflamed the passions of Apollo. 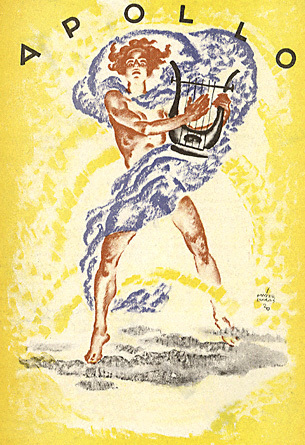 One day while Apollo and Hyacinthus were practicing throwing the discus, Zephyrus, the god of the west wind, who was also attracted to the young prince, and jealous of Apollo's amorous affection towards the boy, made the discus veer off course by blowing an ill wind. The discus, which Apollo had thrown, hit Hyacinthus, smashing his skull. Apollo rushed to him, but he was dead. The god was overcome with grief, but to immortalize the love he had for the beautiful youth, he had a flower grow were his blood had stained the earth. Apollo also loved the young boy Cyparissus, a descendant of Heracles. The impassioned Apollo gave Cyparissus a sacred deer, as a love token. The young deer became tame, and was the constant companion of the boy, until a tragic accident occurred. As the young deer lay sleeping in the shade of the undergrowth, Cyparissus threw his javelin, which by chance hit, and killed the deer. Grief-stricken by what had happened, Cyparissus wanted to die. He asked Apollo to let his tears fall for all eternity. With apprehension Apollo transformed the boy into a tree, the cypress, which became the symbol of sorrow, as the sap on its trunk forms droplets, like tears. Apollo could also be ruthless when he was angered. The mortal Niobe, boasted to Apollo's mother Leto, that she had fourteen children (in some versions six or seven), which must make her more superior than Leto, who had only bore two. Apollo greatly angered by this slew her sons, and Artemis killed Niobe's daughters. Niobe wept so much that she turned into a pillar of stone. Apollo was infuriated when the satyr Marsyas challenged Apollo to music contest. After winning the competition, Apollo had Marsyas flayed alive, for being so presumptuous, as to challenge a god. Apollo was worshiped throughout the Greek world, at Delphi every four years they held the Pythian Games in his honor. He had many epithets, including "Pythian Apollo" (his name at Delphi), "Apollo Apotropaeus" (Apollo who averts evil), and "Apollo Nymphegetes" (Apollo who looks after the Nymphs). As the god of shepherds he also had the cult titles "Lukeios" (from lykos; wolf), protecting the flocks from wolfs, and "Nomius" (of pastures, belonging to shepherds). Being the god of colonists, Apollo influenced his priests at Delphi to give divine guidance, as to where the expedition should proceed. This was during the height of the colonizing era circa 750-550 BC. Apollo's title was "Archigetes" (leader of colonists). According to one legend, it was Apollo who helped either Cretan or Arcadian colonists found the city of Troy. In art Apollo is at most times depicted as a handsome young man, clean shaven and carrying either a lyre, or his bow and arrows. There are many sculptures of Apollo and one of the most famous is the central figure from the west pediment of the Temple of Zeus, at Olympia, showing Apollo declaring victory in favor of the Lapiths in their struggle against the Centaurs. The story of Apollo and Daphne, as told by Thomas Bulfinch. The story of Apollo and Hyacinthus, as told by Thomas Bulfinch "Copyright (c) 1999 Encyclopedia Mythica. All rights reserved." this is part of a larger site that has alot of mythological work. Nice page with info about Apollo,with a pronunciation file. Apollo's image on a greek coin. Apollo and info on the sun. Apollo was the second only to Zeus as the most important Greek god. He was the God of the Sun,of the arts(especially of music), of prophecy,and of archery. He was the lawgiver and punisher of wrongs;the patron of medicine,who could also bring plagues;and the protecter of herdsmen. He was known by the Romans aw well as the Greeks as Apollo, or Phoebus("bright," "Shining" "Pure") Apollo. He was portrayed standing or striding,as a handsome,beardless youth with virile strenght and flowing,golden hair. Inscribed on his temple at Delphi were his two famous precepts: "Know Thyself" and "Nothing in exess" The bow and the lyre were dear to him,the laurel his sacred plant. For all his solar brightness,he had a lesser known darker aspect, with both light and dark reflected in his symbols. Apollo was known as a pure,holy,and cleansing god,whose attributes were analogous to the sun, which was his most important symbol. Singing Swans,Apollo's sacred birds circled around Delos seven times as his birth became immanent, and Zeus gave him a chariot with swans when he was born. Even so,the raven and crow-the dark birds-were also associated with Apollo,as were the snake and the wolf. His punishments could be cruel,and he could act vindictive." Jane Shinolda Bolen,M.D. "Gods in Everyman:A New Psychology of Men's Lives and Loves"
A poet's drop of ink? Though black and foul before. So soon to be forgot!